The 2018 ornament depicts the Capitol as it is seen from Capitol Lake with snow cover and Canadian geese swimming. A silver finish with snowflakes in white and blue encircle the ornament. 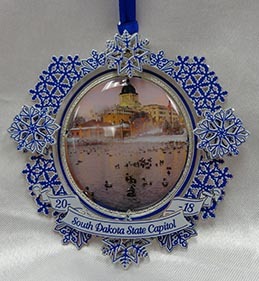 The bottom of the ornament has a white sash that reads "South Dakota State Capitol" in white letters and the top shows the year 2018 in royal blue letters. This collectible ornament will arrive in a blue box with a distinctive ornament presentation on the cover. This makes a wonderful gift to family and friends. Also consider the 2015 first annual collectible, 2016 second annual collectible, 2017 third annual collectible and South Dakota Commemorative ornaments while the limited quantities remain available.